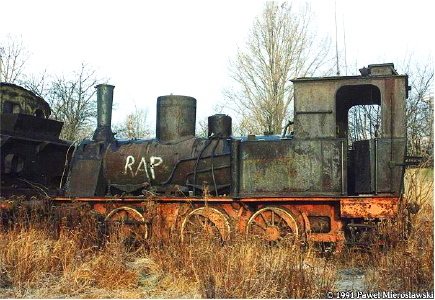 The story of Poland’s oldest steam locomotive provides a good illustration of the unresolved problems that still endanger the future of Poland’s railway heritage. The tragic ending is typical of the fate that befell many historic items of rolling stock. The engine – the oldest steam locomotive in Poland – was built by the German locomotive builder, Henschel, in their Kassel works in 1885. The locomotive spent WW II working in the Janikowo Sugar Refinery and when the war ended was transferred to the custody of the National Railway Museum in Warsaw. All seemed well until, towards the end of the 1990s, a new organisation was created to defend Polish railway heritage – Fundacja Ochrony Zabytkow Kolejnictwa (The Foundation for the Preservation of Railway Heritage) – headed by Jerzy Rezigiel. Although a number of senior PKP Directors joined the board of the foundation, it was significant that no representatives of Poland’s fledgling railway heritage movement were involved in this venture. 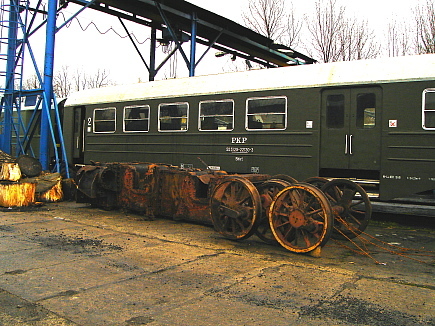 The Foundation set up a ‘railway museum’ at Krzeszowice near Cracow. In the 1997, Tkh 5 was transported there. Here the locomotive began to vanish piece by piece! The scandal of the ‘railway museum’ at Krzeszowice deserves an article all of its own, and despite BTWT’s considerable investigative abilities, even we haven’t been able to figure out the whole story. Suffice it to say that the ‘museum’ resembled a scrap yard and that over the years a number of locomotives that had been sent their for preservation ended up as scrap. Tkh 5 still exists, but only just. Its damaged well tank frame and three wheelsets were transported earlier this year to the skansen at Chabowka, where, if you you attend the steam gala on 6 – 7 September, you’ll be able to see them. This entry was posted on Wednesday, 6 August 2008 at 09:46 and is filed under Uncategorized. You can follow any responses to this entry through the RSS 2.0 feed. You can leave a response, or trackback from your own site.